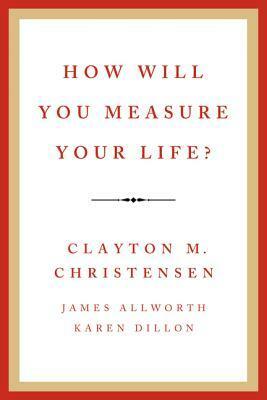 Book : How Will You Measure Your Life? Innovator's dilemma applied to your personal life. I found it insightful and painfully revelant to my life re consulting vs building my product company with recurring revenue. In 2010 world-renowned innovation expert Clayton M. Christensen gave a powerful speech to the Harvard Business School's graduating class. Drawing upon his business research, he offered a series of guidelines for finding meaning and happiness in life. He used examples from his own experiences to explain how high achievers can all too often fall into traps that lead to unhappiness. The speech was memorable not only because it was deeply revealing but also because it came at a time of intense personal reflection: Christensen had just overcome the same type of cancer that had taken his father's life. As Christensen struggled with the disease, the question "How do you measure your life?" became more urgent and poignant, and he began to share his insights more widely with family, friends, and students. In this groundbreaking book, Christensen puts forth a series of questions: How can I be sure that I'll find satisfaction in my career? How can I be sure that my personal relationships become enduring sources of happiness? How can I avoid compromising my integrityand stay out of jail? Using lessons from some of the world's greatest businesses, he provides incredible insights into these challenging questions. How Will You Measure Your Life? is full of inspiration and wisdom, and will help students, midcareer professionals, and parents alike forge their own paths to fulfillment.